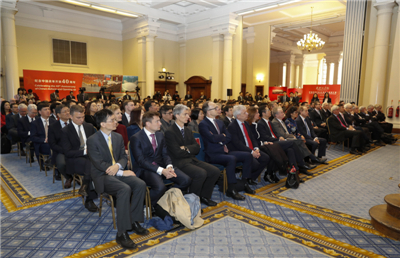 On the morning of December 11, 2018, the Chinese Embassy held the commemorative event of the 40th Anniversary of China’s Reform and Opening up in the Central Hall of Westminster, London. Ambassador Liu Xiaoming delivered a keynote speech entitled Great Cause, Great Achievements and Great Future. 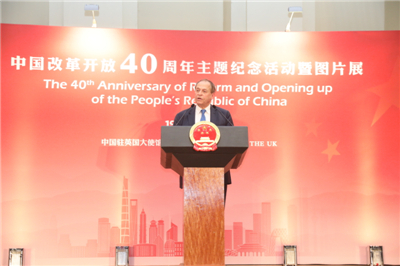 Martin Albrow, honorary Vice-President of the British Sociological Association, Stephen Perry, Chairman of the 48 Group Club, and Geng Jinhai, Chairman of CCCUK, also addressed the event respectively. About 260 people were present including the Rt Hon. Andrew Mitchell MP, former Secretary of State for International Development, the Rt Hon. Lord Clement-Jones CBE FRSA, Deputy Chair of APPCG, the Rt Hon. Lord McNally PC, former Minister of State for Justice, Creon Butler, Director of Cabinet Office, Sir Iain Macleod KCMG, the FCO Legal Advisor, Matthew Rous, Chief Executive of China-Britain Business Council, Ian Macgregor, Editor Emeritus of the Sunday Telegraph, Sir Anthony Seldon, Vice-Chancellor of the University of Buckingham and other guests from British government, parliament, business, science and education, culture and media sectors as well as representatives of overseas Chinese and Chinese institutions in the UK. 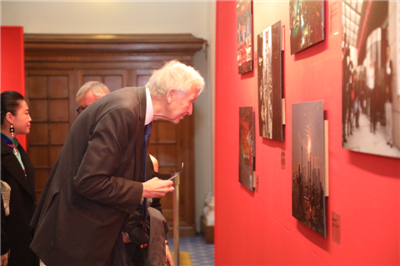 At the event, the Chinese Embassy and China News Service jointly held a photo exhibition commemorating the 40th anniversary of China’s reform and opening up. The Ambassador noted that among the many lessons over the past 40 years, there are four most valuable ones. The first lesson is that fortune favours the brave and hard working. Over the past forty years, China’s GDP has been growing at an average annual rate of 9.5% and increasing by 33.5 times. It now stands at $12 trillion. China has become the world’s second largest economy, biggest industrial country and largest trader in goods with the biggest foreign exchange reserve. These achievements are not a handout from others, but results of hard efforts by the Chinese people. The third lesson is drawn from a Chinese motto, “the ocean is vast because it admits all rivers”. In the past 40 years, China emphasized independent development as well as open and win-win cooperation. China has welcomed foreign businesses with open arms and vigorously explored access to the world. China has enhanced mutual learning and connectivity with other countries in the world in an open and inclusive attitude. The once closed and semi-closed country has become one that opens up all fronts. The fourth lesson, a quote of Confucius, is that “to establish ourselves, we should help others establish themselves and deliver benefits to the whole world”. In the past 40 years, China has always shouldered its responsibility as a big country. It has played an important role in tackling the Asian and international financial crisis and contributed more than 30% to global growth for many years in a row. China has been a stabilizer and powerhouse of world economy. The Ambassador emphasized that China’s reform and opening up is an on-going process. China will not stop its steps. China will never seek hegemony as it grows stronger. Instead, China will remain committed to peaceful development, win-win cooperation and world peace, development and prosperity. China has taken concrete actions to live up these words by sharing its visions with the world that reflect the trend of times, building an international platform for open cooperation and connectivity, creating more opportunities for equal-footed and mutually-beneficial cooperation, and displaying the courage to shoulder its responsibilities as a big country. 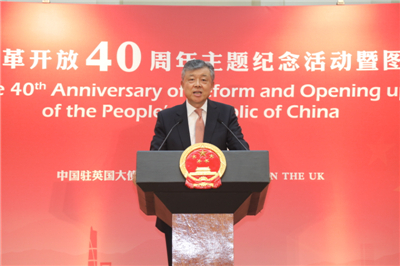 Ambassador Liu pointed out that China-UK relations, after 40 years of leap-and-bounds, is a best illustration of China’s deep integration with the world. In this new historical era, how to seize these opportunities and deepen China-UK cooperation is an important issue to be addressed by people from all walks of life in both countries. China and the UK should always view each other’s development as opportunities rather than challenges or threats. They should take a long-term and strategic perspective, respect each other’s sovereignty and territorial integrity, and refrain from undermining each other’s core interests or strategic mutual trust. The two countries should promote business cooperation in the spirit of partnership and address global challenges with an open mind. 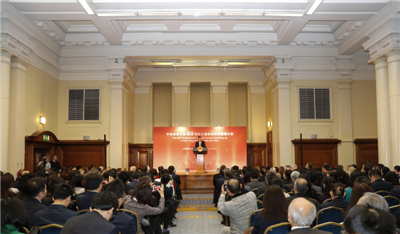 Going forward, in the spirit of reform and innovation and with the courage to overcome all the difficulties ahead, China is ready to join hands with the UK and other countries to seize the opportunities of cooperation and share development benefits so as to build a community with a shared future for mankind. 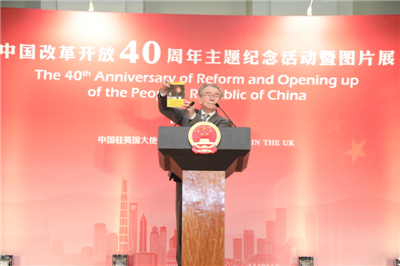 Professor Martin Albrow, one of the first globalization theorists, said in his speech that it was China’s opening-up which kick started globalization in the West. “Opening-up has never been either the victim or the child of Western globalization.” “China’s opening up is based on a much more rounded view of the world than globalization. It implies reciprocity, between peoples and individuals, and a harmonious world within and between cultures.” The Belt and Road Initiative and the concept of building a community with a shared future for mankind can be China’s decisive contribution to the world’s need for the reform of global governance. Mr. Perry said in his speech that in the forty years since reform and opening up, from agriculture to industry and other aspects of the society, China has made enormous changes and achieved impressive results. China has never pursued hegemony to change the world, but always changed and perfected itself. Looking forward to China’s future, by mid century, China will be back to the centre of the world stage, and contribute greatly to the development of the world. Mr. Geng said in his speech that China’s reform and opening up is a period of apprenticeship, learning and building trust. With the deepening of reform and opening up, China-UK economic and trade cooperation has been enhanced and Chinese companies in the UK have been flourishing. These companies have gained experience and acquired technical know-how. In return, their investment has created jobs, paid taxes and contributed to the social and economic development in the UK. 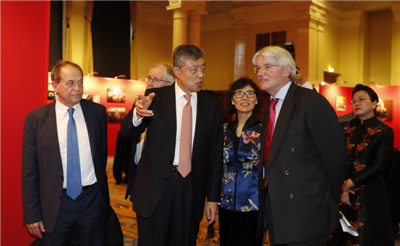 Afterwards, Ambassador Liu and Madam Hu Pinghua accompanied the guests in viewing the photo exhibition commemorating the 40th anniversary of reform and opening up and the live display of traditional Chinese hand-made embroidery by a seamstress from Miao minority. 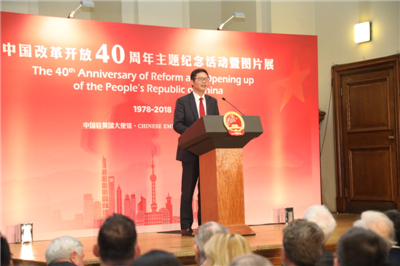 The speeches and photo exhibitions gave the guests an excellent summary of the great progress of China’s reform and opening up over the past 40 years, and enhanced their understanding of China’s development and its significance to the world. The guests marveled at the great achievements of China’s reform and opening up. A few elderly overseas Chinese were moved to tears at the development of their motherland. On the afternoon, the exhibition was opened to the public. About one thousand visitors viewed the exhibition on the day.